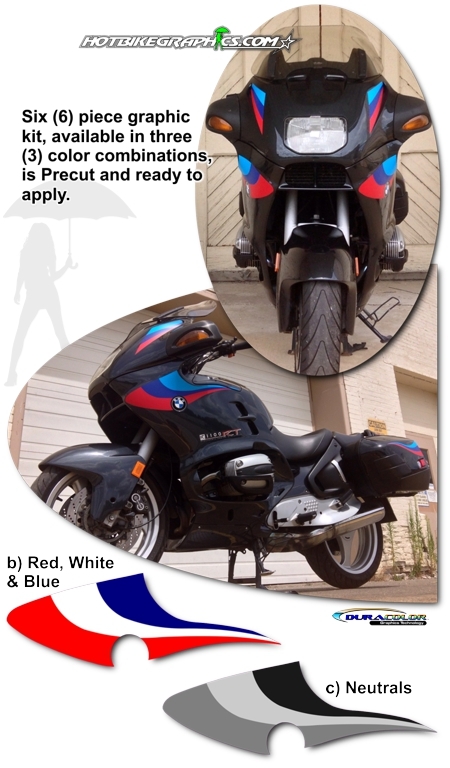 Set your BMW R 1100 RT or R 1150 RT apart from the rest with this great-looking easy-to-install six (6) piece Graphic kit. Created specifically for '99-'04 BMW R 1100 RT and R 1150 RT bikes, this kit will Sport up your ride in no time. The DuraCOLOR manufacturing process for this item features a unique tri-color design in color combinations offered. Moreover, the graphics are covered with a 2 mil clear laminate which will protect the graphics from miles of abuse.